This practical guide provides in-depth coverage of the physical properties of fats and oils, including surface and rheological characteristics as well as crystallization and phase behavior for improved nutrition and functionality in the design of new food products. 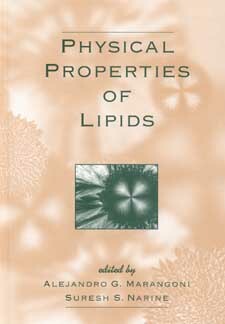 It not only identifies the relationship between lipid structure, processing conditions, and resulting macroscopic properties for the development of novel food products, it also contains current research in areas such as hydrogenation, interesterification, deodorization, and fat fractionation. This is a comprehensive and timely source for food scientists and technologists; food, flavor, enzyme, and lipid technologists; physical, surface, and colloid chemists; nutritional and chemical engineers; biochemists; microbiologists; and toxicologists; and for students in these disciplines.